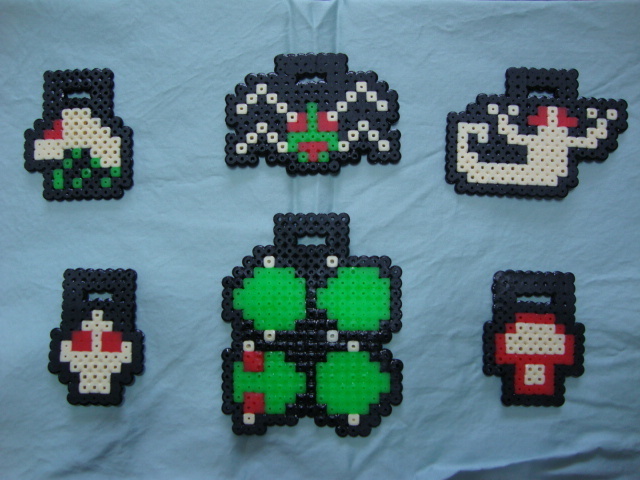 These are Centipede Sprite badges, which I have created using Perler Beads (melted plastic beads). Here is (from left to right) a flea, a spider, a scorpion, the player, a 4-segment centipede, and a mushroom. I am selling these badges for wear at this year's Megaplex: Retro Arcade! $5 for the centipede, $4 for the scorpion and spider, and $3 for the flea, player, and mushroom. This is available for preorder, which will be delivered to Megaplex. If you are not able to attend, add $2, and I'll mail it to you in the US. Payments by Paypal is most prefered.